Just in the confluence of the Rivers Tietar and Tajo there is a magical place, called "El Salto del Gitano". A massive granite cliff overlooking the river, it has a very large colony of Griffon and Black Vultures. 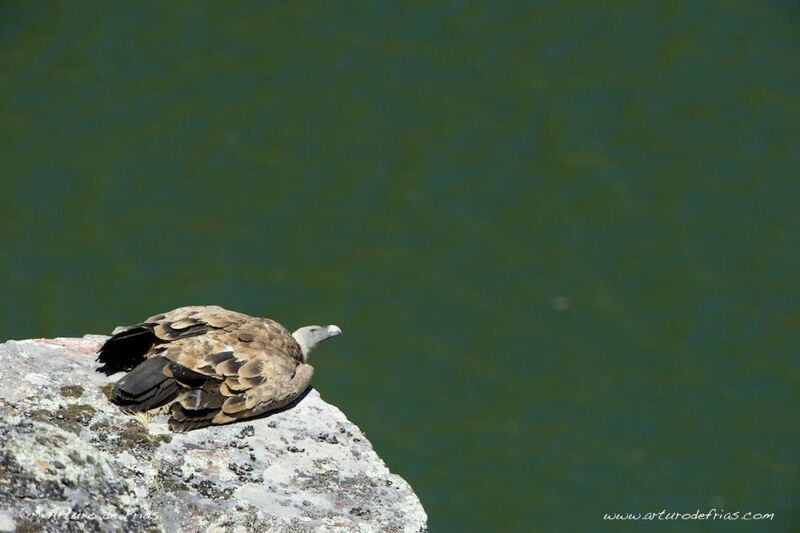 In this image, a Griffon Vulture rests and enjoys the warmth of the day, by the Tajo River, in Monfrague. The image shows an unusual behaviour: the vulture is lying on the rock, probably attracted by the fact that the granite has been heated by the summer sun. Buitre Leonado (tomando el sol en el Salto del Gitano, en Monfrague, con el rio Tajo de fondo. La imagen muestra una conducta inusual: el buitre se ha tumbado en la roca, probablemente aprovechando que el sol la ha calentado.